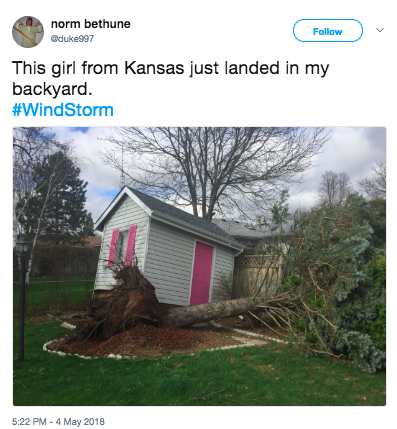 TORONTO — TORONTO — Powerful winds wreaked havoc in southern and central Ontario as well southern Quebec on Friday, leaving tens of thousands of people without power, causing flight disruptions and claiming the lives of at least two people. Wind gusts of close to 120 km/h were observed in the wake of a cold front that moved across the province, Environment Canada said. The weather agency lifted its wind warnings for the most of the region Friday evening except for parts of southeastern Ontario. Police west of Toronto said a tree fell on two men in Milton, killing one and injuring the other. "They were working on tree servicing, and as they were doing that, the wind picked up and a tree fell on the two individuals," Staff Sgt. Jeff Foster with Halton regional police said. He said a 28−year−old man was pronounced dead at the scene and a 18−year−old man was rushed to a Hamilton hospital with life−threatening injuries. Foster said the Ministry of Labour is investigating. Hamilton police said that just before 7 p.m., a man in his 50s was found unconscious on a road and "in contact with live wires." Witnesses said the man had been trying to clear downed power lines from the roadway. Police said the man was pronounced dead shortly after emergency services arrived on scene. Meanwhile, Pearson International Airport suspended operations for about two hours due to the extreme winds. The airport lifted its "ground stop" by about 8 p.m., but warned travellers of continued delays. Hydro One said approximately 155,000 customers were without power early Saturday morning, adding that all available crews were responding to outages. "Our priority right now is to respond to emergencies and start repairing main lines so that we can get the largest numbers of customers restored as quickly and safely as possible," CEO Greg Kiraly said in an online statement. 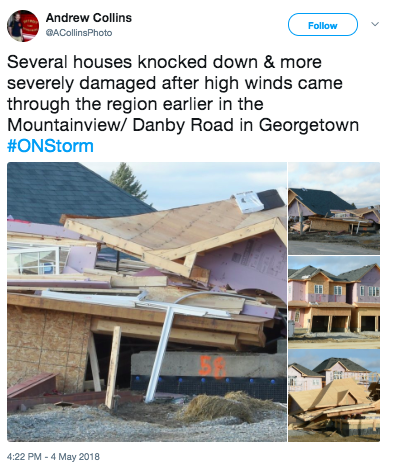 In Milton, the winds downed 12 hydro poles, leaving some 10,000 customers without power. 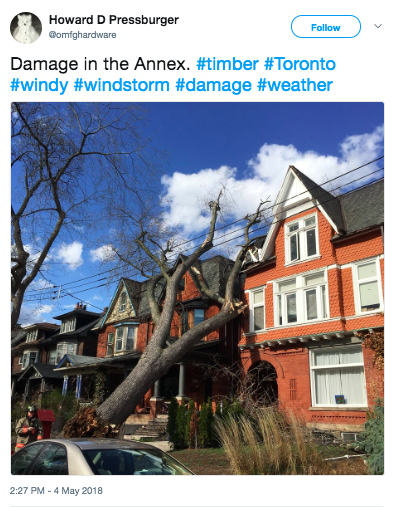 Toronto Hydro said its crews were making good progress overnight to reconnect customers, however, about 34,000 remained without power, and that some repairs could take most of Sunday to complete. Police forces across the region said they are responding to many calls of downed wires, poles and trees, resulting in multiple road closures. Peel regional police said a tree came frighteningly close to striking a school bus in Mississauga. Police said 72 children between the ages of seven and 10 were on the bus at the time, but there were no reports of injuries. 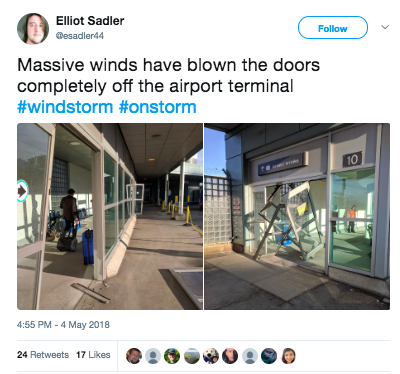 The damaging winds also swept across southern Quebec causing a wave of blackouts and grounding or delaying numerous flights at Montreal’s Trudeau International Airport. Hydro−Quebec was reporting more than 266,000 customers in the dark early Saturday, including almost 45,000 in Montreal. The utility was also dealing with almost 70,000 blackouts in suburbs south of the city and more than 37,000 in the Outaouais region of western Quebec. Environment Canada had issued wind warnings for the province, predicting gusts of 90 km/h in several regions.